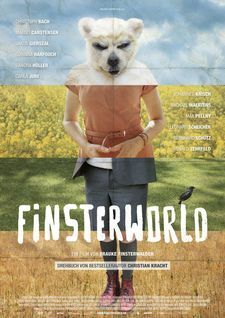 I love Finsterworld. 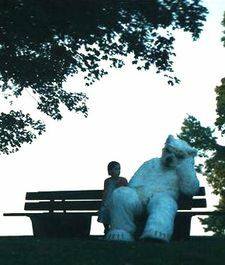 This tragicomic movie with a fursuiter is a treat for smart watchers. A stranger approached the Furry community to get this movie review. He was a journalist for a European film festival, seeking our perspective. When he said “fursuit fetish”, he was greeted with dislike for media exploiting our thing. But I found the question respectful, without cherry-picking responders. I sent a response that I might be a good match, because I organize fur meets in San Francisco (where fetish gets more tolerance than most places)- plus I work on movies professionally. This is my thing! It can hurt to lump together all of the dreaded media (hiss!) as exploiters. “Furries are hiding stuff- it must be bad.” Journalism is important, and the difference between Euro movies and Hollywood is like the difference between types of journalism. This journalist made the kind of approach that any storyteller would take to learn about a subject. FINSTERWORLD approaches it’s audience sincerely, too. We meet ordinary German people – including history students, an idealist teacher, a rich couple, a pedicurist and his patient, a cop and his documentarian girlfriend, and a nature-spirit hermit in the woods. One has a secret Furry fetish. Another reveals a perverse habit that’s very German black comedy. It might make your eyes pop out while you laugh in disbelief. The perversity isn’t graphic or mocking. It’s implied tastefully and respectfully, with psychological depth. They’re characters to care about. It’s what Americans consider an “art house” movie, with a modest budget. This mature, complicated drama doesn’t give brain-blasting spectacles and simplistic heroics. It’s more like reading a really good book. Hollywood has made much less of these since the 1970’s, when directors were influenced by Euro films. It’s a treat for smart watchers familiar with that stuff, and willing to read subtitles. Even if you aren’t into that, expect a great experience. It’s thoughtful, but much more than talky – thanks to rich cinematography, music, and performance. It’s deeply written, with a solid heart. You’ll laugh. The ensemble of characters seek love and meaning in life. They examine their beliefs, identities, relationships, jobs, history, and homes. As journeys and encounters link them together, most of them get lost on the way to what they’re seeking. They only find how absurd life can be. The story shows: Idealists are powerless against random cruelty. Selfishness and obedience both lead to fascism. Fascism and love are equally blind, and love guarantees no happy ending. Happiness starts with being true to yourself, but truth can hurt as much as a lie. Some people never learn the meaning of what life does to them, and there’s no clear heroes or winners. The happiest ending goes to a lunatic. It’s poetic tragicomedy. It’s entertainment first of all, but it’s influenced by German philosophy. “Existential alienation” from self is at the heart of scenes themed around confinement and darkness. That’s why it has an important furry character who expresses himself by confining himself in a bear suit for cuddles in the dark. “Finster” is a German word for gloomy and dark. The dark scenes are very important. Some are magical and loving. Some look like the Black Forest of fairy tales. And when the history students visit a concentration camp, it gets as brutal as the worst things people can do to each other. A police man approaches a stopped car. The driver is nervous and sweaty, because a ticket might end his job serving elderly people. He avoids the ticket by bribing the cop with gifts. The cop has flexible ethics, but a good heart. He’s got something else inside, too… his secret furry nature. It helps him to express inner feelings he doesn’t let out in regular life. The furry cop has a thing for other costumes as much as his own uniform. His good heart, flexible ethics, and uniformed authority have a lot to do with Germany – his personal story is the story of his society, too. This is great writing! He’s a fleshed-out, complicated human. The story makes us really care about him. This is the kind of furry character I want to see. The movie isn’t all “furry”. It just has a fursuiter who is one of an ensemble. He’s a modest, but important ingredient. That aspect is why I got a review opportunity, while the movie is still gaining exposure. Most watchers won’t have my perspective on this movie. In real life, many furries want it known that they only like the art and community, and have NOTHING to do with fetish. But many others do. The fetish aspect is debatable. Watchers should set aside documentary realism about it and value the artistic meaning. Pay attention to how the movie was made with real fursuiters. I have a rule: it’s true 99% of the time that when you see cheap commercial mascot suits in a movie to represent “furries”, the story will be shallow and bad. In my book, using real fursuiters is a good sign that the story understands us. The fur meet scene isn’t realistic. Furry conventions aren’t mainly about secret cuddles in the dark. It doesn’t show mundanity of a fursuit changing room, frantic rave dancing, or lines of ordinary nerdy fans who don’t dress up. But why would we want to see that? It’s meant to be mysterious and magical. It’s not real, but it’s sincere. The director, Frauke Finsterwalder, has made documentaries before. This is her first fiction movie. In the movie, the documentarian character is frustrated and pathetic, and it’s a funny, self deprecating comment about movie making. The character just doesn’t know how to approach people to get meaning out of what she’s trying to do. There’s a furry approaching other furries for cuddles, a cop stopping a nervous driver, and a journalist with sensitive questions… all of them bring lots of meaning to the story, in the way that they face frustration and breakdown in communication. Finsterworld invites you to think about if we ever truly get to know each other and see the light inside. You never know what to expect when you meet strangers in the dark.